Muslim Brotherhood – Jeremiah Wright Declares that Yahweh is Allah | Stop Obama Now!! Wright Proclaims – Allah is God! 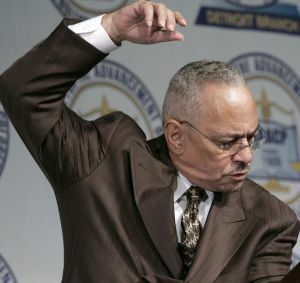 Jeremiah Wright declares that the God he worships is the same as Allah, the God of the Muslims. At the same time, Wright is preaching that the God of the “slaver” and “oppressor” (read white society collectively) is a “different” God. That is, implying that white America and the white race collectively worship Satan, which is a tenet of Black Liberation Theology. It is a theology which confronts white society as the racist Antichrist, communicating to the oppressor that nothing will be spared in the fight for freedom.”, quoted from “Black Theology and Black Power” by James H. Cone (1969), page 135. Black Liberation Theology teaches the genocidal Black Nationalist cult concept that white society, America and the traditional Christian church are all part of the Antichrist system and the black man is the “manifestation of God on earth.” The uniqueness of the divinity of Jesus is denied. Jesus is a prototype that any man can potentially achieve. A revolutionary black messiah or messiahs will led the destruction of the Antichrist and his tool, the American constitutional republican system, in their scenario of the imminent end times and create a Utopia on earth, the biblical millennial kingdom on earth, which will be a physical kingdom, not a spiritual kingdom. This could be seen as the same, then, as the Muslim Caliphate, the earthly kingdom that the Muslim Brotherhood and Al Qaeda seek to establish. The racial concept of Black Liberation Theology has parallels to Nazism (in reverse). Since cultural Marxism has expanded the concept of Marxism to include reverse racial identity doctrines, at the same time it can be considered cultural Marxist, though it may seem contradictory. Obama writes in his book, “Dreams from my Father”, that Wright dabbled in Black Nationalism and Islam in the 1960’s. Black Liberation Theology was inspired by the cult doctrine of the Nation of Islam. Obama was a Muslim as a child in Indonesia and has embraced his ethnic Muslim family in Kenya. Though he has not been practicing Islam for about 40 years, he can be considered an ethnic or cultural Muslim and is obviously identifies rather intensely with Islamist culture. Wright studied a black Muslim Brotherhood for seven years in divinity school and has incorporated some of the mysticism into the black liberation doctrine that he preached at Trinity United Church of Christ. This can explain Obama’s obvious partiality to Islamic culture and the Muslim Brotherhood, that the God of Islam is the true God and the God of traditional Christian Americans is the Antichrist. This is a cult belief system and it is truly amazing that we can have a president in the White House, who is a adherent of such a seditious, racist, cult doctrine, without any real meaningful public recognition and discussion of it by the media — even the conservative media — or by Christian, so-called religious leaders. The concepts of Black Liberation Theology have existed in America and the black Carribean since well before the Civil War. James H. Cone formalized this black identity cult religious doctrine in the late 1960’s in what would seem to be an effort to better spread the basic concepts of the Nation of Islam among black churches. 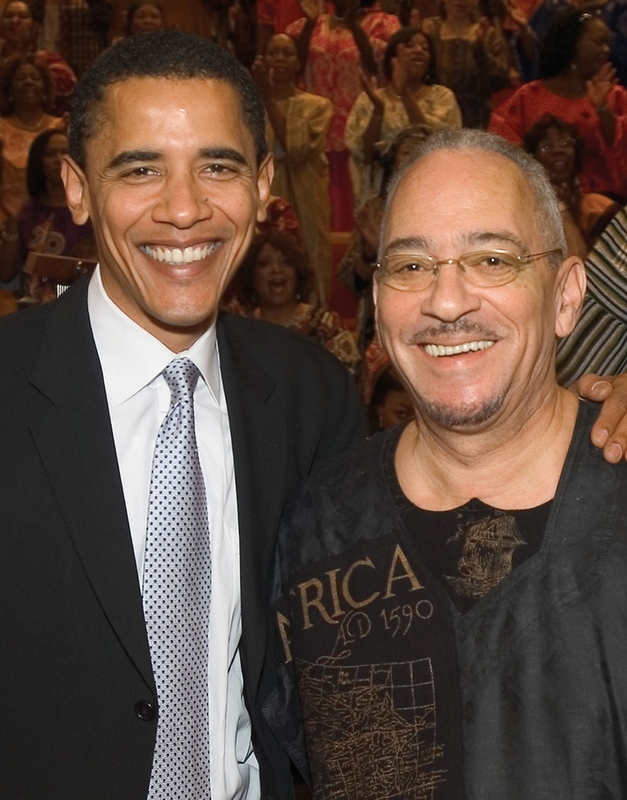 Obama’s spritual guide, Jeremiah Wright. Wright also states in in his book on the history of Trinity United, “A Sankofa Moment”, that he studied a mystical African Islamist order, based on Sufism, called the Tijaniyya, and wrote a a master’s thesis on it at the University of Chicago School of Divinity. Such Muslim Brotherhoods are the forerunners of today’s umbrella Islamist order, the Muslim Brotherhood, which has spawned so much terrorism and was allied with the Nazis in WWII. The English words “assassin” and “hashish” stem from the name of another such mystical order, active during the crusades, the Hashashiyya order. The Muslim Brotherhoods are the equivalent of the secret societies of the west and Black Nationalism, in general, has always been much influenced by the mysticism of such secret societies, such as Freemasonry. Black Liberation Theology is a form of Black Nationalism. Black Nationalism is a movement of several secret societies or secret orders, which generally have a goal of destruction of the current system and transformation of the world into Utopia. The point is that there is a lot of commonality in cult religious concepts between these Black Nationalist sects, such as Trinity United Church of Christ, and the Islamist mystical secret orders, the Muslim Brotherhoods, that has spawned much of the terrorism in the Middle East. This can also help explain the obvious sympathetic relationship that Jeremiah Wright and Barack Obama feel to similar Islamist orders and also explain their antagonism to traditional Christianity. It’s not that they are crypto-Muslims, but that they feel they worship the same God as the Muslims in opposition to the traditional church, which they believe teach worship of Satan and the Antichrist. (2 Peter 2:1) But there were false prophets also among the people, even as there shall be false teachers among you, who privily shall bring in damnable heresies, even denying the Lord that bought them, and bring upon themselves swift destruction. ALLAH IS NOT A GOD!!!! ALLAH DOES NOT EXIST! YEP–THAT’S IN THE BIBLE–STILL IN THE BIBLE..
Oh allah exists, we just know him as Lucifer, Satan or the father of all lies. Allah was actually a moon god, one of 365 arabic gods that muhammed picked. He also had 3 daughters–written about in the koran then later removed, aka the Satanic Verses or the Story of the Cranes. The Nation of Islam and Black Liberation Theology are similar, especially in thst neither is based on biblical truths. This man is now, and always will be the Brother of Satan. He is a contemptible fool and idiot. as well. But that’s O.K. because God has a place for this kind and will serve him accordingly,AMEN????? Allah is the Arabic word for God. Arabic Christians and Jews refer to God as Allah as well. Now as Christians, we don’t worship the Allah of Islam but the Allah of the Bible. Yet there is nothing wrong with the name Allah. Other than the Allah/Yah weh thing (which is true) what bad thing did he say? Nathan, I don’t normally waste a lot of my time arguing with fools. He is talking about white society collectively and by “Allah” he means the God of Islam, which is not compatible with the Trinitarian concept of traditional Christianity. We are in an English-speaking country here, where people normally use the word “Allah” to refer to the God of Islam, regardless of what it means in Arabic. http://en.wikipedia.org/wiki/Allah_(disambiguation) and http://en.wikipedia.org/wiki/Allah Wright is wrong and no Christian should be fooled by him. well fed african americans? I am beginning to think their evil well fed unamericans?